Chameleons are famous for changing color in order to blend in with their surroundings. This little guy doesn't really need to, though; at just an inch long he's the smallest chameleon in the world. Discovered on a small islet just off Madagascar, this tiny reptile is one of a new species called Brookesia micra, reports the Daily Mail. 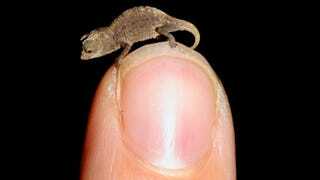 It's thought to be one of the smallest reptiles on the planet — and is definitely the smallest chameleon.